It’s been a busy week. Delivered a breakfront to schenectady NY. Took the Annie Sloan Just Paint workshop at work. It was fun and I learned a lot. I now know how to remove those random bristles that get on furniture while applying stain, paint or finish. . It’s always been a huge frustration and Gail shared the answer. I have started making coathangers, hook/racks out of random pieces of wood and drawer pulls. They are interesting and I would like to get some architectural hardware to use. I picked up a pair of busted half sized cue sticks on Wednesday. Jess and I went to goodwill and there they were for 49 cents each. I fond a broken cue at work a year ago and I plan to make a tripod base for something. Should be cool. 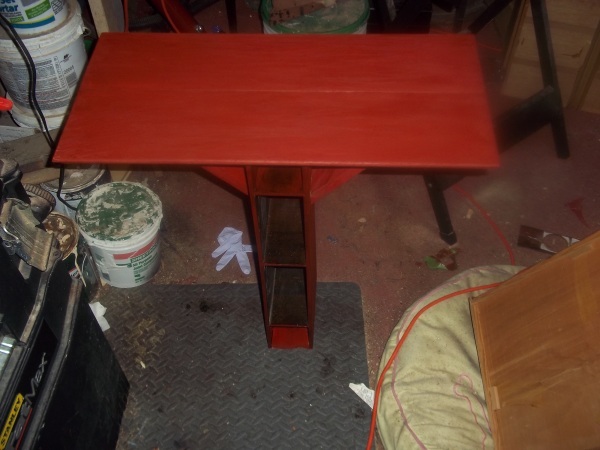 Stained the drawer/desk organizer table bright red. It looks cool. I also added some supports. I need to add 5 pounds to the base for extra stability and that table will be for sale. I also finished the dry fit of the small square mosaic table. I should glue it next week. I also cut out the legs for that table. It’s been busy. I am up to 6 songs now for 50/90. I try not to think too hard about doing 44 more. I wrote the 6th one last night. There is this guy named John Cole who has a blog and his cat was killed yesterday by his sister’s dog. It’s awful. the cat has been the mascot for his blog for a long time and the viciousness and suddeness are hitting him hard and I found myself strangely sad and grieving for a cat and a I person I have never met. I left my condolences and I wrote this 51 second punk song about loss called I am sorry (you’ve got to try). I will almost have enough inventory to do a flea market and maybe join the arts guild by mid August. 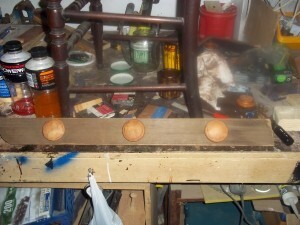 This entry was posted in 50/90, music, old projects, scrap wood, tables, wood working by brighid. Bookmark the permalink.